Colin Jacobs made his Prince George debut a scrappy one Saturday as the Cougars skated to a 6-3 preseason win over Red Deer. The 6'2 center, who arrived in PG last month after a trade from Seattle, was unable to get in on any of his club's half-dozen goals but still made a mark with under five minutes to play by earning instigator, fighting major, and 10-minute misconduct penalties after a dust-up with Rebels defenseman Kevin Pochuk. The Texas-born forward is better known for using his hands elsewhere (80% in shootouts last season), having just five majors in his WHL career and none since December of 2010. Tate Olson, a 6'1 defenseman who isn't eligible for the NHL draft until 2015, led Prince George with a pair of goals including the game winner. The Cougars return to action Sunday against Medicine Hat. 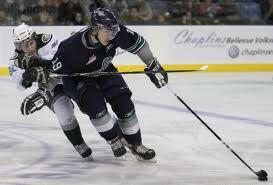 In Friday preseason play, Logan Nelson finished -1 as Victoria was downed by Kamloops, 5-3. A 23-goal scorer a year ago, the game was Nelson's first in front of Royals new bench boss, Dave Lowry. Clay Spencer ('13) scored two goals in a losing effort. Victoria will continue their exhibition schedule on Friday when they host Kelowna.